Cool article in BusinessWeek on the potential use of biomatrials in electronic devices. It is about time that we start seeing some malleability in the rigid "blocky" forms of our computing devices. Should allow for some interesting innovation in User Experience. Am not sure if any these concepts will see the light of day in anytime soon. 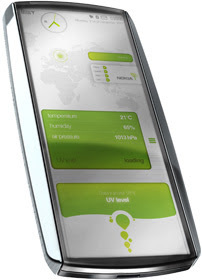 Pic: A Nokia Eco Sensor concept phone that senses your environment. The design does look cool but not that malleable.